One of my goals is to spend 5 days outdoors this week. With that in mind, I wanted to venture to some where new. Made arrangements to meet up with a friend. After talking, we decided on Grey Wolf Ridge via the steep Tyler Peak Trail. 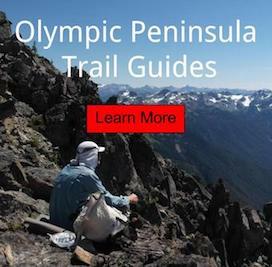 This trail was originally made unofficially by hikers, climbers and hunters to provide access to the northern area. The person that originally cut the line for this trail (maybe a game trail at one time), has a funny sense of humor. The trail just goes straight up the hillside and pretty much dont let up till you reach the top. There are hardly any switchbacks, like you would find on a traditional path. The route description that i read is 2.5 miles to the ridgeline. It takes some time to reach the top with a heavy backpack, since the grade is so steep. 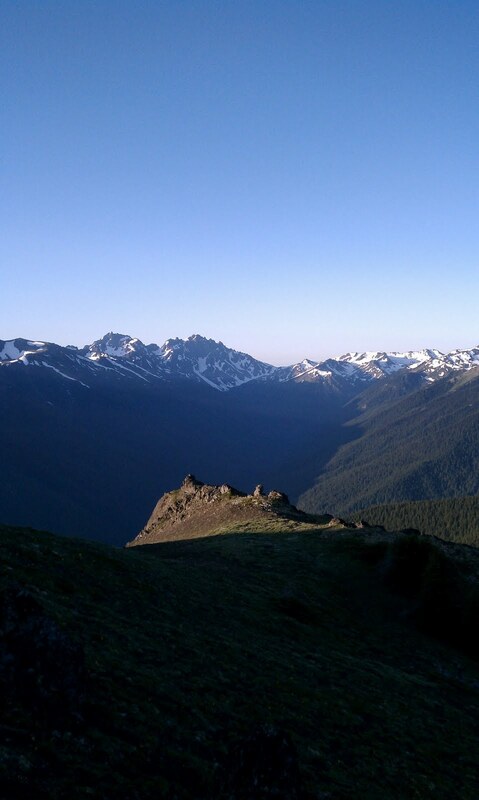 Once a hiker does, the views are well worth the effort. They are some of my favorite. The summit at 6,400' really showcases the surrounding area. You could see most of the northern west major cities in Washington and Canada. Mount Baker was also in view. 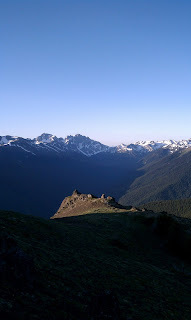 Views of mountain ranges in the Olympic National Park and National Forest at your back was also nice. The two that jump out is Mount Constance and Mount Deception. Deception being the one that I attempted to work my way to the summit, but it got too steep and had to come back down. The route was to steep for my foot wear around 500' shy of the destination. We chose a little saddle in the ridgeline that was tucked away from the wind and easy access to views of the sunset. I chose to lay out in an open air using bivy for this overnight trip. Because of that, I got woken by an ant that had crawl in onto my nose, so that was a fun moment. There was also a wet dew that fell overnight, because the skies were clear. Falling back to sleep I remember the stars being out in full effect. I observed several shooting stars fall from the sky that night. The next morning we had to lay out all our gear in the sun and attempt to dry it from the heavy dew that fell the night before. Also spent some time melting snow to replenish my water supply. After breaking camp, we headed back down the mountain to enjoy a nice greasy meal in town.